YANGON, Myanmar – Facebook said Monday that it forbids Myanmar's powerful military chief, Senior General Min Aung Hlaing, and 19 other individuals and organizations from his location to prevent the spread of hate and misinformation. The social media giant has been heavily criticized for allowing ethnic and religious conflicts in the country, especially against minority Rohingya Muslims. It has been accused of being lax in many countries in the fight against online misinformation and manipulation, but in Myanmar it is the closest to lethal force. 8 Facebook accounts, one Instagram account and 52 Facebook pages have been deleted. Last week CBSN spoke with Reuters' worldwide investigative reporter Steve Stecklow who wrote about the discovery of more than 1000 examples Posts, comments and images on Facebook are attacking the minority group. Stecklow said the social media platform is the only source of news for many people in Myanmar with millions of users. "It triggered violence when rumors surfaced on Facebook, in July 2014, for example, there were false rumors," said Stecklow. "It has led to unrest. People died. I mean, that's really a life and death situation. " About 700,000 Rohingya fled last year in response to a brutal riot-scale military campaign in Myanmar's western state of Rakhine, which was charged with massive human rights violations accused of ethnic cleansing or even genocide, an allegation rejected by the government stating that it is responding to attacks on security forces. Facebook's action came the same day as one of the UN's top people English: a report titled "Facebook is a useful tool for spreading hate in a context where Facebook is the Internet for most users. 19659002] "Facebook has improved in recent months, but only slowly reacts ineffective," it says in the UN Human Rights t approved report of the fact-finding mission to Myanmar. "The extent to which Facebook posts and messages have led to discrimination and violence in the real world needs to be independently and thoroughly investigated." Four high-ranking officers and two military units targeted by Facebook were also put on a blacklist by the US government earlier this month over human rights violations. The sanctions block property owned by them in the US and prohibit US citizens from engaging in transactions with them. The US already maintains restrictions on visas, arms sales and support for Myanmar's military. In June, the EU imposed similar sanctions on seven senior army and police officers, all of whom are on Facebook's blacklist. Six men on the Facebook list were also mentioned in the UN Human Rights Report, in which Myanmar's leaders should be prosecuted for genocide. As "priority issues for investigation and prosecution" he recommended, among others, Commander-in-Chief, Senior General Min Aung Hlaing. In a statement, Facebook referred to the UN report, which "has found evidence that many of these individuals and organizations have committed themselves, or we have committed serious human rights violations in the country, and we want to prevent them from serving us to further fuel ethnic and religious tensions. 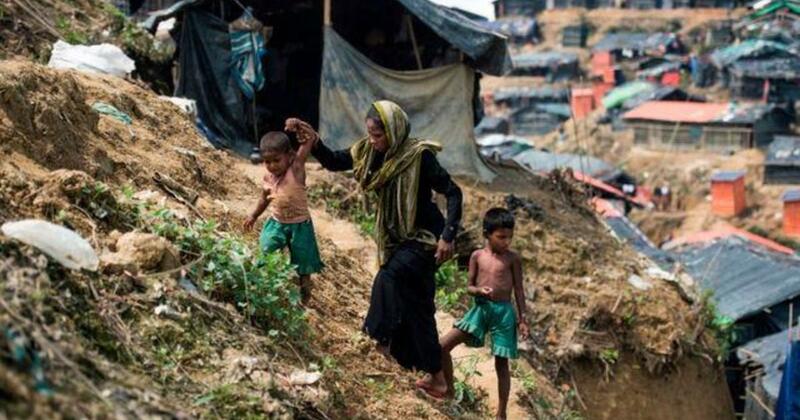 "The Rohingya discrimination was deep and widespread even before Facebook spread. Facebook has been under pressure for several months to take action, especially after civil and human rights groups in Myanmar said in April that it has failed to act against online hate speech inciting violence against the country's Muslim minorities and failed to enforce their own rules. "The ethnic violence in Myanmar was really horrific," said Facebook in its statement. "Although we were too slow to do anything, we're making progress now – with better technology to detect hate speech, improved reporting tools, and more people to review content." "We continue to work to prevent the misuse of Facebook in Myanmar – including through the Independent Human Rights Impact Assessment we commissioned earlier this year – a huge responsibility as many people rely on Facebook for information We are so determined to become even better in the future. " Yangon-based political scientist David Mathieson said that the action of Facebook along with the damned UN Report Myanmar's military forces are forcing "into an isolation they do not like." "You need to find alternative ways to communicate with Myanmar's population, because Facebook is the internet to many people, and Faceboo I've just expelled the Supreme Commander from the Internet," he told the Associated Press.